Description: Eleven girls, one female and one male teacher, all identified. Front row, left to right: Agnes Simmson, Lorna Wentzell, Jean Gow, Edith Shaw, Helen Kaizer. Middle row, left to right: Barbara MacDormand, Marguerite Rudolph, Mary Louise Rudolph, Genevieve Anderson. Back row, left to right: Vivian Foley, Miss N. Ashley, Jean Newell and Mr. L. Hancock. Members of the girls Bridgewater High School basketball team. They are seated on the steps in front of two large doors of the high school. Eleven of the girls are wearing white blouses, dark shorts, ankle socks and sneakers. The woman in the middle of the back row is wearing a dark dress and jacket. The man is wearing a suit and tie. 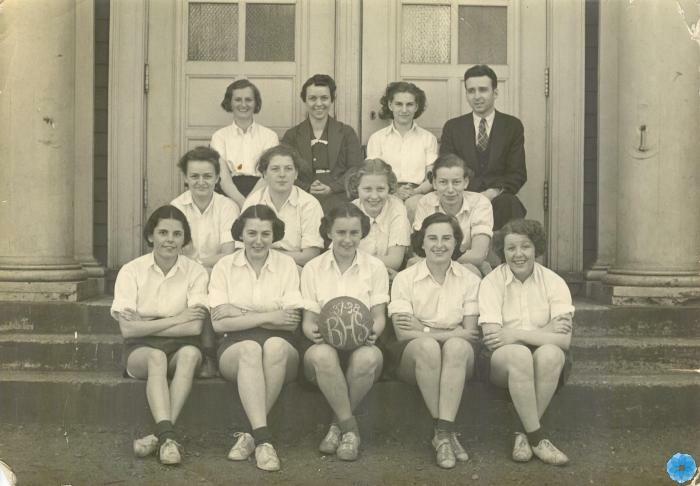 The girl in the centre is holding a basketball with 37-38 BHS written on it. History of Use: Taken to document girls high school basketball team.